An early release of 100 residential lots at Stockland’s $5 billion city of Aura, south of the Sunshine Coast, have already been snapped up by preregistered buyers ahead of the official launch of land sales on Saturday. A $50 million construction is also underway with the creation of Aura’s first suburb well advanced in preparation for the early 2017 arrival of the first residents. Up to 200 workers are already on site building Aura’s first streets and introducing new services. 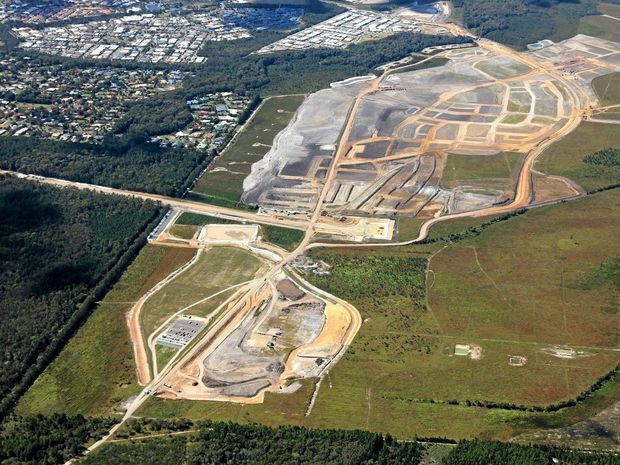 Ben Simpson, Stockland’s regional manager for the Sunshine Coast, said economic modelling conducted for the company showed Aura would deliver an $11 billion boost to the south-east Queensland economy during the masterplanned community’s 30-year development. A $50 million construction boom is also underway with the creation of Aura’s first suburb well advanced in preparation for the early 2017 arrival of the first residents. Aura would also sustain more than 2150 direct construction jobs each year and provide 39,000 direct and indirect local jobs once it became a fully operating city, he said. Pre-registered buyers had shown great interest, with 100 contracts secured in the past 30 days on land at Aura’s first suburb, Baringa. “We are delighted with the strength of early demand for home sites at Aura, which represents a great show of faith in our vision for this exciting new community,” Mr Simpson said. Today’s celebrations, which coincide with the opening of a new-look Aura Vision Centre, will be held from 10am-1pm in the Bells Reach display village. A variety of residential lots to suit a wide range of budgets and buyers – from first home buyers to upgraders, growing families, downsizers and investors looking for a brand new, low-maintenance home – will be available in the public land release. Mr Simpson said the lots ranged in size from 250 square metres to 576 square metres and were priced from $192,500 to $268,900. All were exclusively available to customers who had submitted an expression of interest. New aerial photographs of Aura showed the extent of civil construction and earthworks at the first suburb of Baringa with streets and neighbourhoods already taking shape. Mr Simpson said construction work on the first homes was expected to start before the end of the year and be ready for Aura’s first residents in early 2017. “The first Aura homes will be close to schools, shops and the Lamerough Creek Conservation Area and will all be within walking distance of parks and playgrounds. Work of the first stage of the $115 million Bells Creek Arterial Road is also progressing well. The first suburb, proposed to be named Baringa, will eventually comprise 1560 home sites on Aura’s northern boundary, making it comparable in size to Stockland’s Brightwater community at Mountain Creek. “The name ‘Baringa’ means summit and is a word from the Kabi Kabi language, which pays tribute to the indigenous heritage of the site,” Mr Simpson said. Aura is Australia’s largest ever masterplanned community under single ownership and will become the first new city in Australia to be designed and constructed to the world’s highest environmental and sustainability standards. Over the next 30 years, the city will be home to around 50,000 people and will include a vibrant city centre and retail hub, an exciting South Bank style urban parkland, an elite sporting and performance precinct, numerous schools and education centres, and two business and enterprise parks. In designing Aura, the Stockland team has drawn inspiration from some of the world’s most liveable cities to enhance the unique liveability and lifestyle of the Sunshine Coast; to create a city that is truly world class.